Air 2 has brought in NicoHale, which is an alternative way to stop smoking. With the help of some special magnets NicoHale removes nicotine, smoke and tar from the cigarettes which provides you a healthier and cleaner smoking experience. NicoHale is available now and claims that it helps you in quitting cigarettes for once and for all. 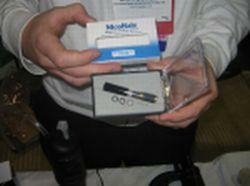 Air 2 came up with digital vaporizers for smoking, uh, herbs earlier. If it’s really worth than paying $40 is not a big deal. But if it’s not then what’s the fun you can buy so many cigarettes in $40. Star Wars Clock – It’s different!